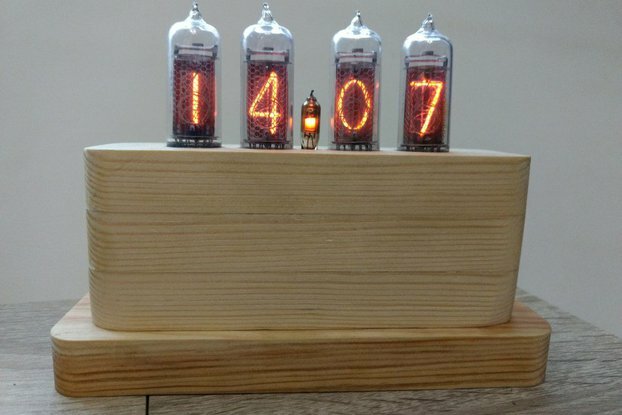 This is a simple clock with 6 Nixie tubes. It is based on wsduino (Arduino-compatible with on-board RTC) and a Nixie shield kickstarted a few years back. The two boards are sandwiched between laser-cut plexiglass plates that act as enclosure. The clock can be set by pushing the top buttons, one incrementing the hours, the other the minutes. The clock also has a jumper to select 24-hour or 12-hour mode. As with all my creations, this clock is also open source. Some details can be found here: http://timewitharduino.blogspot.com/2013/11/another-nixie-clock.html and here: http://timewitharduino.blogspot.com/2019/03/debugging-in-17-nixie-clock-aka-rothko.html The Nixie clock comes with a North-American 9V power adaptor.